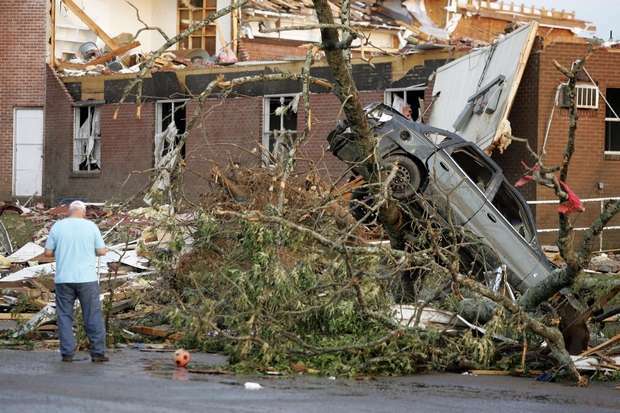 Yesterday, April 27, 2011, a day of weather infamy in the Deep South. And if that’s not enough, the talk from the emergency responders is that this round needs to get cleaned up quickly, before the Mississippi River flooding starts next week. That flooding is also expected to be a record. May The Lord bless these folks, and be near to them in their time of need. Westboro Baptist Church came to town to protest at the funeral of local hero Staff Sgt Jason Rogers who was killed in Afghanistan. Fortunately it didn’t turn out as they had planned. While I personally wasn’t able to participate in the “blockade”, I was privileged enough to drive down highway 471 while my fellow Mississippians were out in force, showing their respect. On this day we weren’t republicans nor democrats we were Americans. Jesus died for our sins, a fact that too often we selfishly accept without a thought. Easter is the celebration of Christ’s resurrection, a powerful notice to Christians that he is the Son of God. My internet friend Jim Baxter sent me a wonderful email a few days ago. It was about the fact that God has no name. God was not of this Earth as himself, but as Jesus; he is this earth, he is us and he is the universe. He alone is what he is and who he is. –All things need God for their being and their well-being. THEREFORE, you alone, O Lord, are what you are; and you are he who you are. For, what is one thing in the whole and another in the parts, and in which there is any mutable element, is not altogether what it is. And what begins from non-existence, and can be conceived not to exist, and unless it subsists through something else, returns to non-existence; and what has a past existence, which is no longer, or a future existence, which is not yet, –this does not properly and absolutely exist. But you are what you are, because, whatever you are at any time, or in any way, you are as a whole and forever. And you are he who you are, properly and simply; for you have neither a past existence nor a future, but only a present existence; nor can you be conceived as at any time non-existent. But you are life, and light, and wisdom, and blessedness, and many goods of this nature. And yet you are only one supreme good; you are all-sufficient to yourself, and need none; and you are he whom all things need for their existence and wellbeing. I know from a personal God Moment, that he is real, it isn’t a question of belief or faith for me. I have felt his love and omnipotence, and its irresistible force. It was out of love that he gave us existence and gave us Jesus, so we could know his love for us. All one needs to do is acknowledge what Jesus means to us, even if one ignores all the wondrous things about us, to dwell in his love forever. God has given us everything and he lets us know in so many ways. That video is just an example of the wonders of God’s universe and all that is in it. It is the beauty of God’s math made simple. May you all have a Blessed Easter Sunday and Praise God for this day. Due to numerous factors, such as rising fuel costs, rising costs of consumer goods and reduced consumer spending, there isn’t as much freight to haul and truckers are looking to the manufacturers to help them meet these challenges, so they may remain profitable. The answer is being addressed by Peterbilt, smaller and more fuel efficient trucks. 1:4 RC model truck pulls a Nissan SUV. The truck is a one-off creation by Luca Bordin a Peterbuilt fanatic. The truck is powered by a 12V car battery and features a horn which works using compressed air. Speaking at the New Hampshire Tax Day TEA Party event, Herman Cain continues to reveal why he is a leading conservative candidate for President in 2012. No embed code is available for this video, as of yet, but I encourage you to click on this link to view it. Perhaps the most critically acclaimed speech for TEA Party patriots was Super Sarah Palin’s at the Wisconsin capitol building. An estimated crowd of 6,500 on a cold and snowy day, heard her best catch phrase which was directed to the GOP establishment to “fight like a girl.” Not only did she send the right message to the GOP establishment, she explained clearly that the GOP isn’t fighting for us at all. Then there was the odd appearance of Donald Trump at the Boca Raton TEA Party event. It is unclear to me when Trump decided he needed to court the TEA Party, he being the same Donald Trump that said President Bush should have been impeached for going to war in Iraq, that supports single payer health care and just switched from the Democratic Party to the GOP in 2009. What videos of his speech today that are available are only snippets, so here is a link to much of what he said at the Sun Sentinel. For my part, it seemed very conceited and self-promoting with no mentions of the greatness of our nation or of the foundation for our republic, the constitution. Mark Levin rips Trump to shreds. Mmmmmmmm the tears of unfathomable sadness......Mmm-Yummmy! The outcome of the election for Wisconsin Supreme Court would please Eric Cartman, and yes, he would lick “the tears of unfathomable sadness” from the radical left that had so much invested in JoAnne Kloppenburg winning. With a big bowl of Shadenfruede chili to comfort Kloppenburg after her premature victory speech, we now have the gnashing of fangs and wails of “conspiracy” and “election-rigging” by the radical left. They served us up with such a delicious array of schadenfruede, it is really more of a goulash than a chili. Can we please, please, please not try to be the smartest ones in the room just this one time and play the game that Republicans always play. Let’s declare victory now and talk about pushing Prosser off the stage. This is the message. Kloppenburg won an election she should never have won. What a humiliation for the Tea Party and their media toads. Prosser should really understand it is time to leave the stage. Prosser sticking around is just hurting Wisconsin. There is serious businesss to conduct and Prosser is just gumming up the works by trying to challenge this. A recount is really pro-forma – the people of Wisconsin have obviously spoken. Of course this means that a majority of those Republican senators are in deep trouble now. Nobody ever would have predicted this type of win. It is humiliating for Walker. This really puts egg on Walker’s face is not over his whole body (ewwwwwww). Walker shoud just declare Kloppenburg the winner and get on with it. Add your own. But whatever you do don’t say, “Nothing’s settled. Now we have to have a recount. Boy aren’t I the sensible democrat.” To hell with that. This is an opportunity. Just remember Willlllllbur, it ain’t chili if it has beans in it and you are full of them. Then comes little prissy Chrissy “Leg Tingler” Matthews. He and his guests were busy determining the significance of the Kloppenburg victory, all the while the breaking news of the new vote count is crawling on the bottom of the screen. It was a delicious spicy addition to the stew. Then, for perhaps the first time in history, Michael Mooron actually contributed to the stew pot, instead of devouring it all, by going on a twitter binge. The lefturds were just entirely too generous this week, when all they had to do was try and be rational about a close election and wait for the official results, but I couldn’t expect them to behave in a fashion contrary to their nature. Now they are upset, but the rational adult voices are displacing their tantrums. Such as Nate Silver of the NYSlimes, of all places. Nevertheless, if you want to allege that there’s a conspiracy afoot, the statistical evidence tends to work against you. Waukesha County’s revised turnout figures are pretty normal for Waukesha County, a wealthy, white suburban county that usually votes at high rates, whereas its original figures were at the low end of reasonable expectations, given the way the rest of the state voted. Also of note is that the number of votes that Ms. Nickolaus says she failed to count in Brookfield, amounting to 11 percent of the county total, is in line with the proportion Brookfield normally represents: the city supplied 11 percent of Waukesha County’s total vote in both the 2008 and 2010 general elections. If this was a conspiracy, it was one executed with an extraordinarily high degree of cunning and competence. I’m more inclined to think that Ms. Nickolaus, who has drawn complaints for her sloppy management practices in the past, is no savvier than she seems. One thing libturds should learn in all this is, never celebrate too soon and never EVER mess with Eric Cartman. Great job from the NRSC. Politico notes that it has drawn 4 times more traffic than obama’s version.